How Good is John Tavares? What do the numbers five, nine, nineteen, twenty-two, twenty-three, and thirty-one have in common with one another? 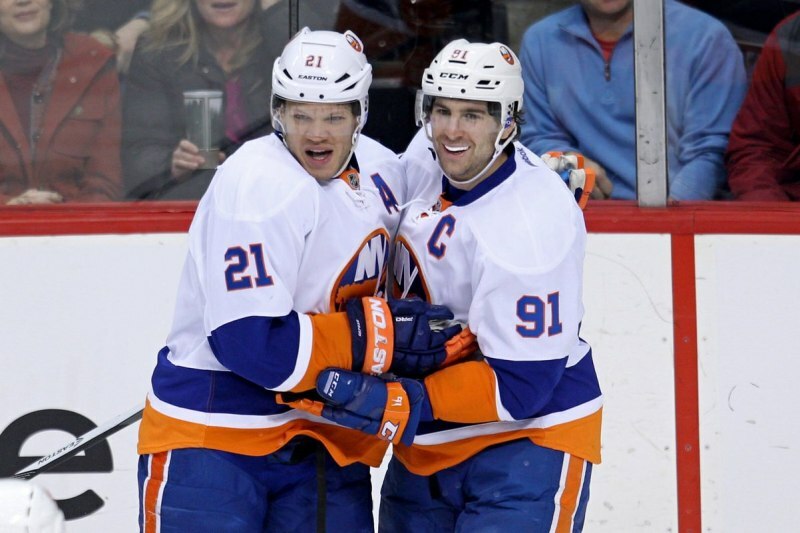 If you are a New York Islanders fan, the answer should come to you quite easily. Those numbers represent six Islander legends (Denis Potvin, Clark Gillies, Bryan Trottier, Mike Bossy, Bob Nystrom, and Billy Smith) and can never be stitched on a blue and orange jersey again. For many years, it appeared as if there would never be another addition to that list of numbers. That was until the 2009 NHL Entry Draft when Garth Snow hit a home run by drafting Ontario native John Tavares with the first overall pick. Although his age has not quite hit a quarter of a century, Tavares is already having the kind of career that will one day put the number ninety-one in the rafters of whatever arena the Islanders happen to be playing in at the time. Captain Tavares had himself an unforgettable 2014-2015 campaign and was the main reason for his team’s unexpected level of success. His 38 goals and 48 assists were not only team highs, but also good enough to put him in the running for the Hart Memorial Trophy at the end of the season. In addition, his 86 total points placed him one point behind Jamie Benn who won the Art Ross Trophy on the last day of the regular season with an assist. Tavares was also one of the leagues best on the power play finishing sixth in power play points and goals. The argument could be made that Tavares was deserving of being crowned the league MVP last season. He led New York in all of the important categories a forward can lead in and the Islanders would have gone nowhere without Tavares leading the way. Tavares’s stock in the NHL has been on the rise since being drafted in 2009 and he is now considered one of the best players in the league. However, where does he actually fall when ranking hockey’s best? Although he may very well one day be sitting at the very top, number 91 is not quite there yet. It pains me to say this but Sidney Crosby, when healthy, is still the top player in the National Hockey League (not including goalies). It is also safe to say that players such as Alexander Ovechkin and Jonathan Toews still rank higher than Tavares as well. One could argue placing Duncan Keith ahead of the Islanders’ captain as well but I would have to disagree solely on the overall impact Tavares has on his team. So if you were keeping track, I would rank Tavares fourth on the list of best non-goalies in the NHL. As he continues to improve (if it’s even possible), Tavares will move past the likes of Crosby and Ovechkin because their production will begin to decrease as they continue to age. However, we must keep in mind that youngsters such as Connor McDavid and Jack Eichel will begin making their way up the rankings and start contending for that top spot as well. Being considered the fourth best player that doesn’t tend goal in the National Hockey League is not a bad place for Tavares to be sitting going into the 2015-2016 regular season. This places him ahead of stars such as Duncan Keith, Eric Karlsson, and Steven Stamkos. Claiming that Tavares is a better player that Mr. Stamkos may be viewed as quite controversial but it still remains true. There is no arguing that Stamkos is one of the best, if not the best, goal scorers in the league. However, Tavares’s overall game surpasses that the Lightning’s number 91. In addition, Tavares has shown the ability to stay healthy while Stamkos has suffered through injuries. There is no denying that John Tavares is one of the best players the NHL has to offer. With plenty of years left in his career, we can only expect more great things from the captain of the blue and orange. One day in the future, the New York Islanders will draft a young prospect and he will be asked to select a jersey number. Unfortunately for him, the number 91 will not be an option, as it will be hanging above the ice for all to see.